HURRY over to the Toms Surprise Sale where you'll find prices up to 50% off shoes, apparel, and accessories. *You will need to enter your email address to view the sale. 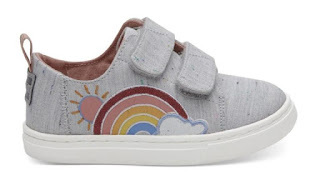 I absolutely LOVE these GREY MULTI DRIZZLY WEATHER TINY TOMS LENNY SNEAKERS on sale for $19.99 (Retail $45)!